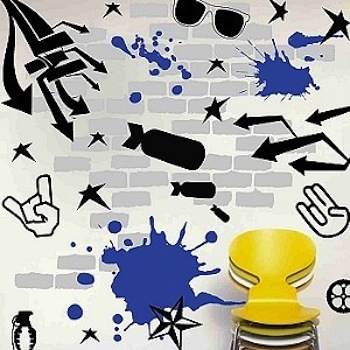 Bricks & ink splash sold separately (look under design packs). Sizes range from (smallest star) 1"- (tire print) 48" Long. Enough to decorate an entire room. You get 2 different sheets to make this pack Awesome! Each of the 2 sheets is 4ft x 2ft for a total of 16 sq/ft of raw urban art. Included in the pack: 2 sheets of urban emblems totaling over 40 pieces. 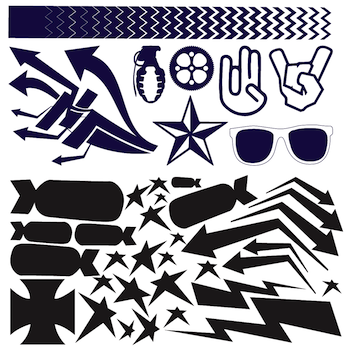 You'll get stars, arrows, gears, nautical stars, grenades, shades, tire tracks, bombs, & lightning bolts. Picture shown with bricks and ink splash (sold separately). With our design packs the possibilities are endless!